The seating rules for the Wedding Party tend to be bent quite a bit these days. There's nothing wrong with that. However, a wise man once said we should "learn the rules so we know how to break them properly". Now, the Dalai Lama may not have been referring to seating arrangements at weddings, but it's good advice nonetheless. The Wedding Party's table (also known as the Top or Head Table) is usually rectangular in shape, while the guest's tables are round. That is the best way to allow the guests to have a full view of the wedding party. In addition, it makes it easier for the wedding party to communicate with the guests. Traditionally, the Bride and Groom are at the middle of the Head Table. The Bride is seated at the right. Continuing to the right of the Bride is her father, the Groom's mother, then the Best Man. To the left of the Groom are the Bride's mother, the Groom's father, and the Chief Bridesmaid. The idea is to alternate gender, while moving outward from Bride/Groom, the Bride's parents, the Groom's parents and the Best Man/ Bridesmaid on the outside. Modern lives and modern families sometimes challenge this traditional setup and adjustments are made for special circumstances. Siblings & best friends as well as divorced or remarried parents are common reasons for change. Other couples just enjoy being different, starting their lives together in their own, unique way. Some couples even decide to forego the Head Table in lieu of a "Sweetheart Table", or simply mingle among the guest tables during the event. In the end, the goal of every wedding reception is for everyone to enjoy the celebration of a couple's new life together. 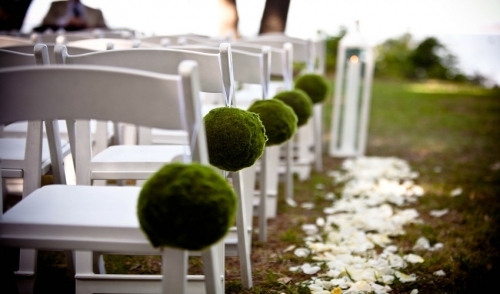 The seating of the Wedding Party and all of the guests should be made to compliment that idea as much as possible.